Preparation is everything, especially for the Christmas season and marketing. 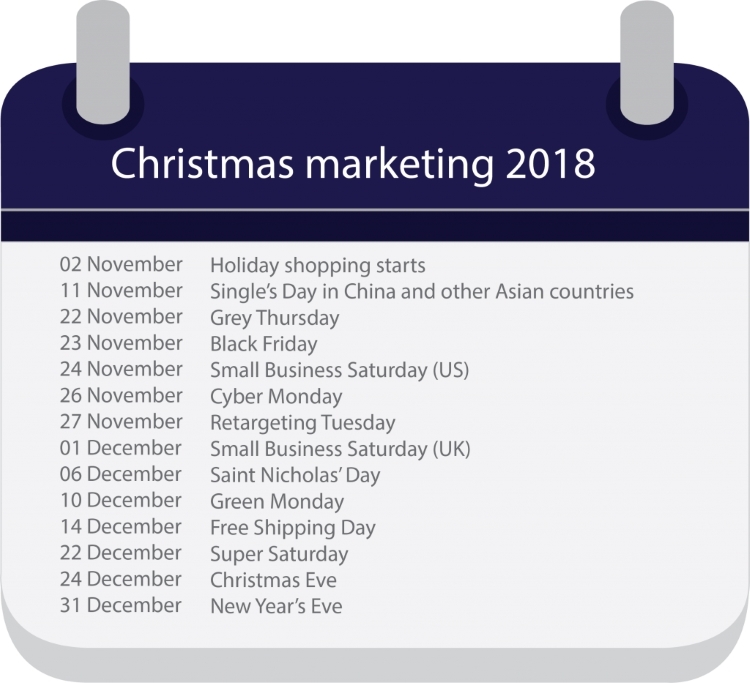 Be sure to mark the following Christmas marketing dates in your calendar for 2018. Around this time, most companies start with their Christmas campaigns. Consumers begin their search for the perfect gift and the (virtual) window shopping starts. Ideally, everything is already prepared to convert these early birds into customers. Never heard of it? Time to change that. In China, and many other Asian cultures, it’s a day to celebrate those without a partner with gifts and celebrations. In 2017, Alibaba, the giant Chinese e-commerce company, generated $25.4 billion US dollar in sales within 24 hours! More than Black Friday and Cyber Monday sales in the US combined. And the trend is getting global, because there are many Asian communities all over the world. Take advantage of this day and offer ‘singles’ day discounts’ to target this group. Grey Thursday is the last day before the famous Black Friday. And is used as a soft launch for the upcoming marketing offensive. It is a great opportunity to prepare your customers for upcoming deals and promotions, publish announcements and present your offers and products for the next days. One of the most famous shopping days of the year, Black Friday. Originally a day for brick-and-mortar retail in the United States, it has now become a giant global e-commerce event that no one can escape. 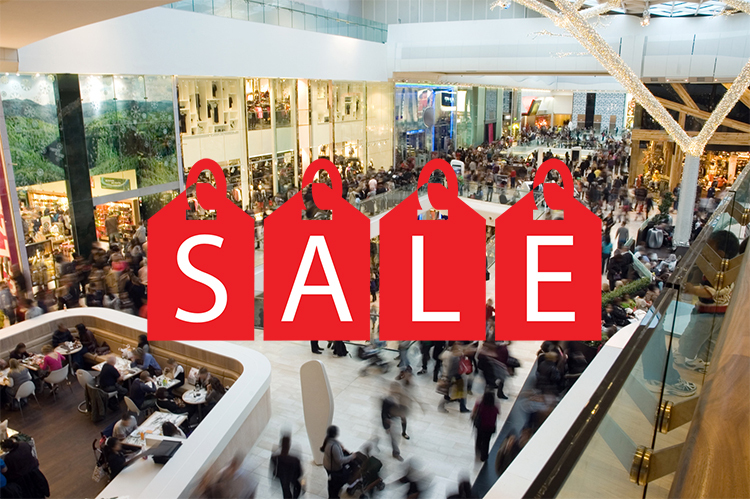 Consumers love good deals and are showered with promotions and discounts on this day. Sales on Black Friday breaking new records every year. You should not miss that. The “Small Biz Saturday” was originally intended to support small local businesses and retailers in inner cities. With the hashtags #smallbizsaturday or #smallbusinesssaturday the day has also arrived online. Many consumers today prefer to support local businesses instead of big retailers. And are even willing to spend more to do so. What Black Friday is for brick-and-mortar retailers (or rather was), that’s Cyber Monday for the online business. Today, every company uses both days for discounts and promotions. Be sure that on these days your website and online shop is in top shape (including the mobile versions) and all content is ready. This is not the time for problems and delays. This term is relatively new in e-commerce. The idea: To retarget potential customers who did not complete their transactions at your website on the previous popular shopping days (like Black Friday, Cyber Monday). And convert them into paying customers. With reminders, newsletters, discounts and even complementary products. Since 2013 the Small business Saturday also exists in the UK. In many countries small gifts are given to children and loved ones on Saint Nicholas Day. At the same time, this day marks the official start of holiday shopping in Europe. Your Christmas campaign should be up and running by today. In 2007, eBay experienced their busiest online shopping day ever. A day so successful, that it got a name – Green Monday. Since then, the second Monday in December has proven to be one of the best-selling days for e-commerce every year. One reason for this: Online shoppers want to make sure to receive their purchases in time before Christmas. A perfect time to remind your customers about delivery times and shipping conditions. And to highlight specials aiming at the time factor. The 14th of December is the last date on which retailers can guarantee timely deliveries by Christmas Eve for standard shipping. And many retailers offer free shipping options. Shipping costs are the most common reason customers abandon their carts. Free shipping, along with time pressure will increase your sales that day. On the last Saturday before Christmas, there are always plenty last-minute customers who have not yet found the perfect gift. It is also the last day for one-day delivery. Retarget not completed transactions, offer express shipping, discounts and vouchers. Experience has shown that the sales figures on this day are particularly high. Even those who have been waiting until the last minute should not be forgotten. And if it is just a voucher. The days after Christmas are also decisive. Return and exchange should run perfectly. And it is also a good time to start your upcoming January campaigns. – The earlier you start planning, the better your results. – Know your customers and their behaviour. – Update your brand and imagery with a festive look. – Optimise your content for all marketing channels (print, online, mobile). 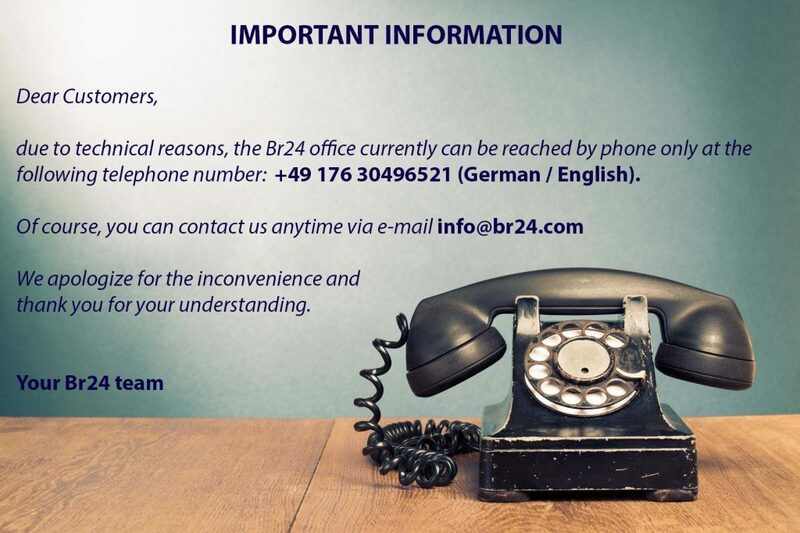 – And rely on the professional services of Br24 for high-quality images.